Custom reversible jerseys are a great time and money saver especially when it comes to youth sports. 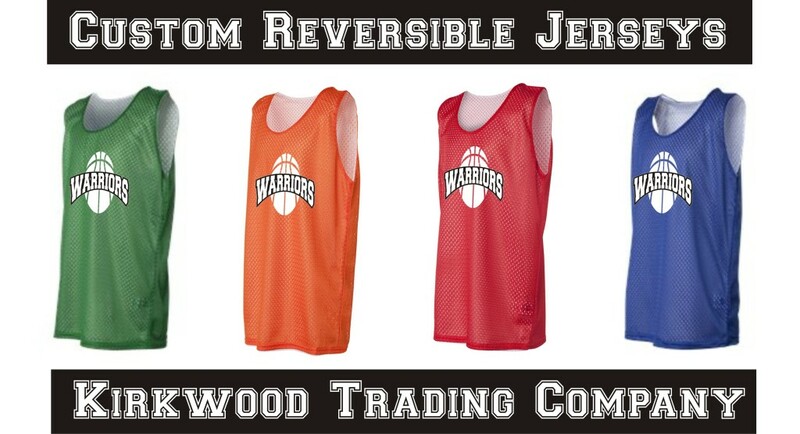 The old reliable custom reversible jersey allows you to purchase one jersey and has a home and away colors in one. Even when you have both sides lettered and numbered it still saves time and money. They are great for practices and and scrimmages and their quality is perfectly fine to use as game jerseys. Most custom reversible jerseys are now made of performance poly so they are soft and wash and wear well. They come in a variety of color options and pretty much cover any team or schools colors. These custom reversible jerseys can be custom lettered and numbered and we can even customize a logo for the jersey fronts. Offered in both youth and adult styles and a variety of colors to match your school or team colors. We can custom print these custom reversible jerseys to meet your specific needs with a 4-6 day turn around on orders. In addition to custom printing we can also customize with letters and numbers as well. Should you need to outfit the entire team we also offer custom athletic shorts and bags and other sports related apparel accessories as well. If you are in the market for a team uniform and are interested in the custom reversible jersey, give us a call and we’ll be happy to discuss your options as well as the color availability and styles. We’ll quote you a price and give you a firm date for turn around on your order. Custom reversible jerseys can come lettered, numbered, or logo printed and you can have us print one or all 3 depending on your specific needs. Kirkwood Trading Company is located in Saint Louis Missouri and we serve a clientele across the United States. So no matter where you are located, we can provide our service to you quickly and inexpensively.